based on the Nissan Patrol (Y62 series). Luxurious and sophisticated, the QX80 is the premium brand’s range-leading, full-size SUV and its arrival will continue Infiniti’s new-model releases in Australia. 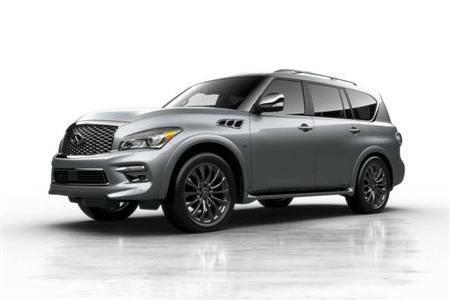 The Infiniti QX80 has a bold exterior design. 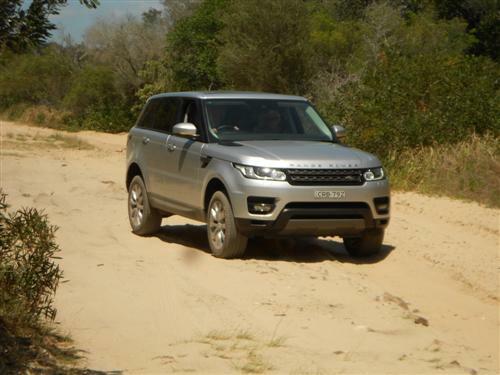 Its unmistakeable presence comes from a combination of size and styling that conveys an underlying sense of power and strength. Its exterior matches a sumptuous interior that is abundant in comfort with space for up to eight people in a two-three-three seating format. Powering the Infiniti QX80 is a 5.6-litre petrol V8 engine that has a peak power rating of 298kW and a maximum torque of 560Nm. This advanced petrol engine features both direct fuel injection and Variable Valve Event and Lift (VVEL) technologies which combine to maximise both power and efficiency. The QX80’s smooth seven-speed automatic transmission works in conjunction with its intelligent ALL-MODE 4x4 drive system to deliver impressive on-road driving dynamics and off-road capability. For Australian customers, Infiniti has specified a raft of innovative technologies to the QX80, including a state-of-the-art Hydraulic Body Motion Control (HBMC) suspension system that reduces body roll on high-speed corners and maximises suspension travel in tougher off-road driving conditions. Safety-related technologies in the QX80 include Lane departure Warning (LDW) and Lane Departure Prevention (LDP) systems, Blind Spot Warning (BSW) and Blind Spot Intervention (BSI) facilities, Distance Control Assist (DCA) for the vehicle’s cruise control system and Infiniti’s intelligent Predictive Forward Collision Warning (PFCW) system, which monitors not only the car ahead to detect the potential for a rear-end collision but the next car ahead as well. Also included is Infiniti’s Back-up Collision Intervention feature, which can detect an object behind the vehicle when reversing and immediately brake the car to a stop if needed. And in keeping with the QX80’s stature, an extensive catalogue of standard features is fitted, including 22-inch diameter sports wheels, an advanced 15-speaker BOSE Premium Audio System (includes two sub-woofer speakers), an entertainment system for second-row passengers and even heating for the leather-upholstered steering wheel. Powerful and refined, the QX80 is also highly capable, with strong abilities to cover off-road terrain and a maximum towing capacity of 3,500 kilogrammes. The QX80 has been packaged to deliver exceptional comfort, convenience and value and will be priced at $110,900* (Manufacturer’s Suggest Retail Price, excludes on-road costs) when it arrives in Infiniti showrooms later this month. Jean-Philippe Roux, the Managing Director of Infiniti Cars Australia, said the Infiniti QX80 is a commanding SUV that will meet a specific local market opportunity. According to Roux, adding the QX80 to Infiniti’s Australian catalogue is a logical move. The arrival of the QX80 later in July will be the next in a series of new-model additions for Infiniti in Australia. From early next year, three all-new models are scheduled to be released: the Q30 active compact, the QX30 active cross-over, and the production version of the Q60 Concept 2+2 coupe, which made its world premiere at America's 2015 Detroit Motor Show last January. Stay tuned to Next Car for further details, in due course, concerning the specifications and equipment for the Australian Infiniti QX80. ** Maximum recommended drive-away price for vehicle in Victoria including 12 months’ registration, 12 months’ CTP and applicable statutory charges, dealer delivery and administration charges. Price is based on a private owner aged 40 with a good driving record and the vehicle being garaged in Victoria. Prices may vary depending on State purchased, individual’s personal circumstances and will vary from dealer to dealer. Additionally, please note that all prices, fees and charges are subject to change without notice, as are the specifications.